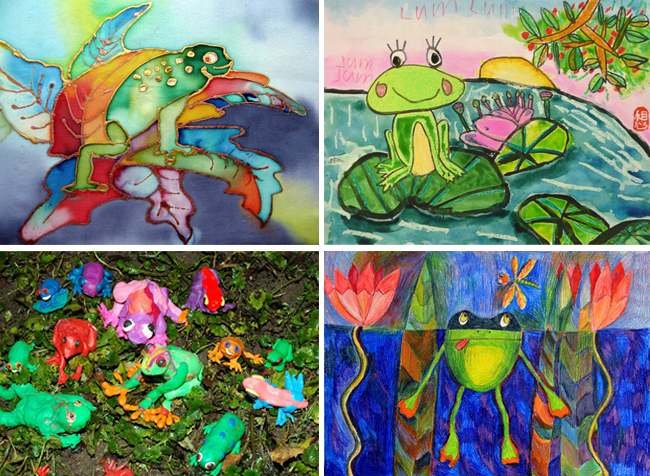 Each Fall Frogs Are Green hosts a Kids’ Art Contest. It gives me such a thrill when hundreds of children from around the world answer that call. These children are enrolled in after school art programs. Their parents must realize how important it is to enrich their child’s education and encourage them to express themselves through art. I grew up in Queens, New York, and my parents enrolled me in ballet and piano lessons, and my father, an accountant by day and an artist by night, would sit with me and teach me how to draw a house or a tree. He was so excited when I chose art as my career and began my higher education at the School of Visual Arts in New York. My brother and sister and I were introduced to a thriving cultural world. We would get dressed up and head into New York for the circus, Ice Capades, ballet, museums, Broadway theater and opera. This gave me a rounded appreciation for the arts that I still feel. Is this culture missing in children’s lives today? I will tell you that the submissions to the 2013 contest yielded 450 entries, but only a few came from the USA. My only conclusion is that children in this country are not being taught arts appreciation the way I was decades ago. Is this due to the digital age of games and apps, or the economy and arts classes/programs being cut? When children spend their days watching TV and playing games that others have created, and they are not learning how to express themselves, this will hurt them later in life. I’m sure of it. 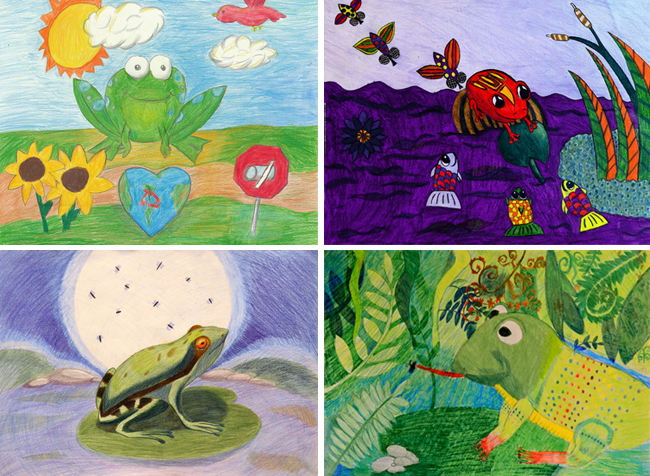 When I see the artwork that comes in from kids between 3 and 12 from Estonia, Australia, the Philippines, Bangladesh, South Africa, Macedonia, Serbia, India, China and so many other countries it’s clear from their skills that they are not learning just about art but conveying their own personal messages about the state of the environment and how they feel about frogs. The USA is just not seeing how important this ability to self-express is, and so it must change for the next generation. I’m happy to share that The Distillery Gallery & Artspace in Jersey City, New Jersey does have art classes for kids (as do a few other places here) on Saturday mornings, and it is partnering with Frogs Are Green to bring our “Green Dream” to life and show why children need this education in their lives. 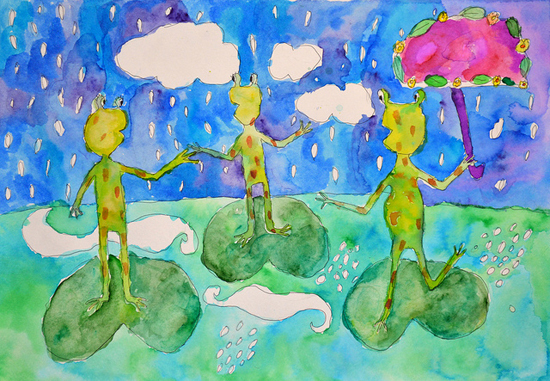 Opening on April 4 and running through April 27, “Green Dream” will be an International Children’s Earth Day Exhibition. It will be the first time Frogs Are Green is showcasing the amazing artwork received over the years. Many of the works will be hung on the walls and a digital projector will show hundreds more. 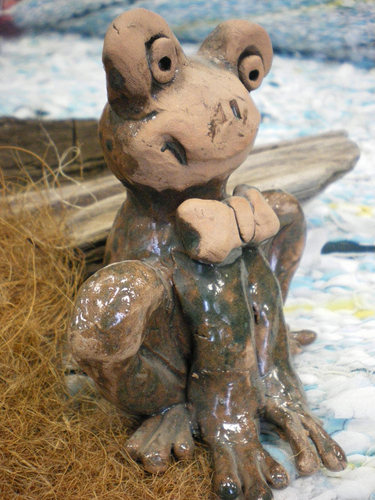 The children in The Distillery art classes will also be showing their frog pictures and are creating flower pots. enter our Kids’ Art Contest and Photo Contest! Contest theme: IT IS EASY BEING GREEN! 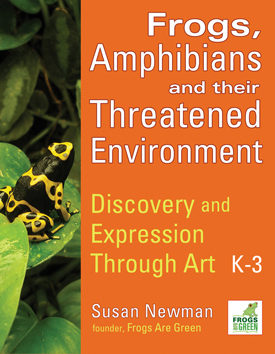 Your artwork can be about frogs and how we can help them, or it can be about ways we can be green at home, at school, or in the community. Deadline for submissions is November 30, 2010 and the winner will be announced December 15, 2010. The winner will be featured in a post and his or her artwork will be used to create a poster for the campaign. The winner will also receive 2 copies of this new poster. All other kids who enter will receive a FROGS ARE GREEN (eco-friendly) wristband. We’re looking for drawings, paintings, sculpture, collage, or whatever format helps you express yourself. Send your digital files or photographs of the objects to us at info@frogsaregreen.com. The files should be no larger than 3MB each. We will accept the original drawings, but please ship with a tracking number for safety, the address is on our contact page. Download this flyer to post for your kids at home or at school. This year we will be accepting submissions in two categories: Frogs in the Wild and Backyard Frogs. Backyard Frog photos would include such photos as a frog perched on your picnic table or other unusual place. Last year, for example, we received a photo of a frog sitting on a pool hose. Frogs in the Wild photos, on the other hand, should feature frogs, toads, or other amphibians in their natural habitat: frog ponds, marshes, in the woods, and so on. PLEASE—no photo manipulation and no photos of pet frogs. Please do not move the frog to get a better photo. Photos of amphibians of all kinds, including salamanders, will be accepted. E-mail all photos to us at Frogs Are Green. All photos should be in jpeg format and no larger than 3 MB. 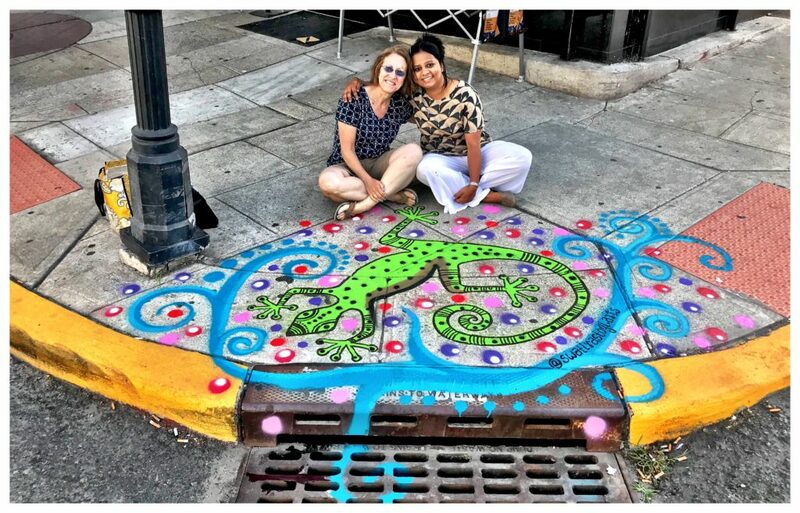 Please name your photo a short but distinctive name (with no spaces, such as, “susan-frog-NJ.jpg”) and include a caption detailing your name, email and the location of the photo. All entries must be received by November 30, 2010. Winners will be announced December 15, 2010. The winner will receive a Frogs Are Green t-shirt or poster of his/her choice or we can design a special t-shirt and/or poster with your winning photo. The photo will be featured in a separate post and the photo will also appear on the front page of the blog all year. Honorable mention photos will appear in a gallery on our blog and the photographers will receive our small Red-Eyed Tree Frog poster.